Many thanks to SWLing Post contributor, Dave Zantow (N9EWO), who notes that he has published a review of the Tivdio V-115 on his website. Dave’s conclusion? This little receiver is a “Decent Low Cost Pocket Set.” I would whole-heartedly agree. I mean, this little radio is widely available on Amazon and eBay for around $19.00 – 25.00 US including shipping! About as inexpensive as a radio gets. Though you pay for what you get, with the Tivdio V-115 (a.k.a. 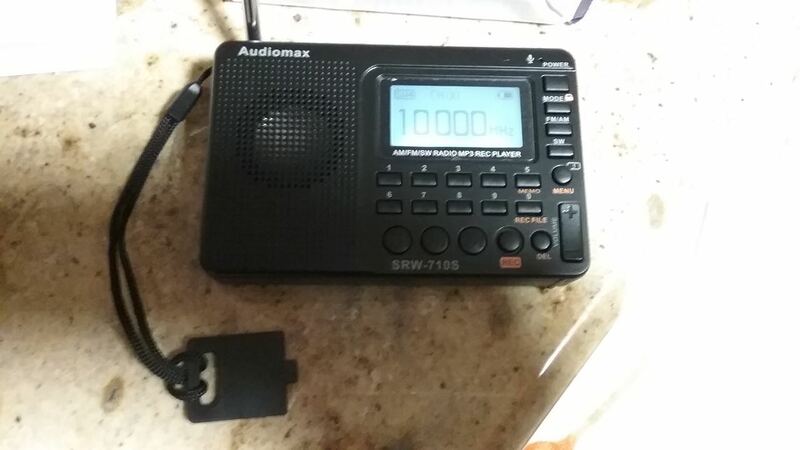 Audiomax SRW-710S), you get a lot more radio than you would expect for the price. Listening to the BBC Midwinter Broadcast on June 21, 2017 in Québec. In terms of performance, the V-115 isn’t on par with even the venerable ($40-50) Tecsun PL-310ET (in my opinion). However, the V-115 has decent off-air recording capabilities and is more sensitive than anything else in its price range that I’ve reviewed (despite internally-generated noise). I receive numerous inquiries from SWLs in India who seek a $20-30 receiver–the V-115 may be a good choice for those on a very tight budget. But Dave’s review goes into great detail about the V-115’s quirks, performance and overall usability. I encourage you to read it before making a purchase decision. Click here to read Dave’s review. The Tivdio V-115 is available via Amazon and eBay. 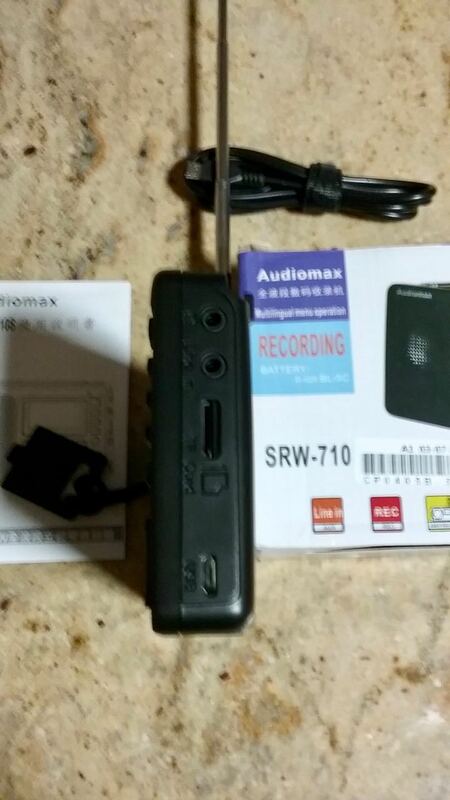 It is also badged as the Audiomax SRW-710S. Click here to read other reviews we’ve posted. This entry was posted in News, Shortwave Radio and tagged Audiomax SRW-710S, Audiomax SRW-710S Review, Dave Zantow (N9EWO), Reviews, shortwave, Tivdio V-115, Tivdio V-115 Review on October 22, 2017 by Thomas. This morning, I received yet another positive comment about the Tivdio V-115 (a.k.a. Audiomax SRW-710S). This little radio is widely available on Amazon and eBay for around $19.00 – 25.00 US including shipping. About as inexpensive as a radio gets. Both Troy Riedel and Tom Stiles gave it an overall positive review. “The TVDIO V-115 is an amazing receiver. It was bought because I needed a small recording device for my portable SWL activities. I put a 32 GB into the slot, and found that the recordings all were of excellent quality. It also doubles as an external speaker for my FDM-DUO qrp transceiver. I’ve only tried the radio part on 25m shortwave, and to my surprice the first station heard was from Brazil. 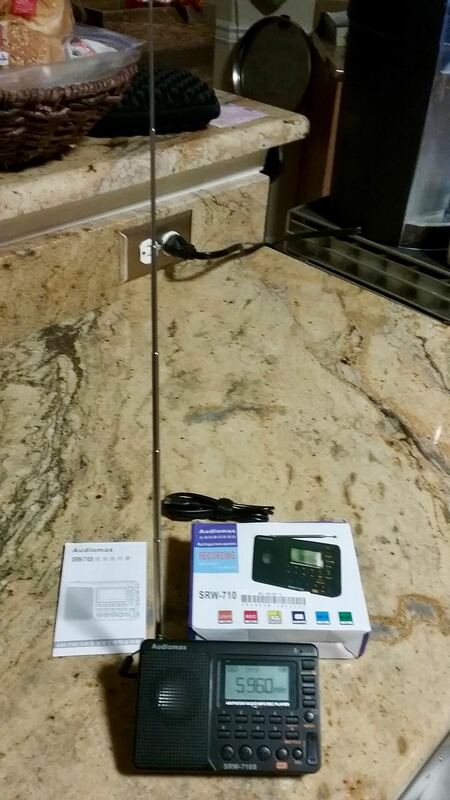 “I recently purchased this TIVDIO radio. I am in Australia and it is a little beast of a machine. I live in rural country area and seem to have no luck with the short wave radio. Everything else is great! I have a 64gb micro SD card in it and can fit thousands of songs in it. The screen is awesome, seems to detail everything going on even has a little spectrum analyzer at the bottom of screen. I agree with these assessments of the Tivdio/Audiomax. I’ve had this little radio for about a year now, but only really started using it around May of this year (this is the same radio I had forgotten that I’d purchased last year). Of course, the best feature is the function that allows you to make off-air recordings and save them to a MicroSD card–it actually works quite well. While in Canada this summer, I recorded a number of FM, MW and SW broadcasts on the Tivdio–so much easier than carrying an external recorder. Though receiver sensitivity is quite good, the AGC circuit is a little too over-active when receiving a weak signal. Last summer, for example, while listening to the BBC Midwinter broadcast in Québec (see photo above), the AGC was so unstable I simply didn’t bother making a recording. Admittedly, I was very impressed a $20 radio could even detect this signal. I found that nighttime mediumwave reception is also problematic, save for the strongest of stations. The V-115 also seems to be quite prone to RFI indoors–more so than, say, a Tecsun PL-310ET. I suspect this is because it’s not shielded very well internally. Not an issue, if you’re listening outdoors, of course. In truth, it’s hard to be critical of this little radio. As so many of you have echoed, for $19.00-25.00 US–? You simply can’t beat it. A great value indeed. Click here to search for the Tivdio V-115 on eBay and click here to search Amazon. This entry was posted in News, Reviews, Shortwave Radio, Shortwave Radio Reviews and tagged Audiomax SRW-710S, Audiomax SRW-710S Review, Reviews, shortwave, Tivdio V-115, Tivdio V-115 Review on September 15, 2017 by Thomas. 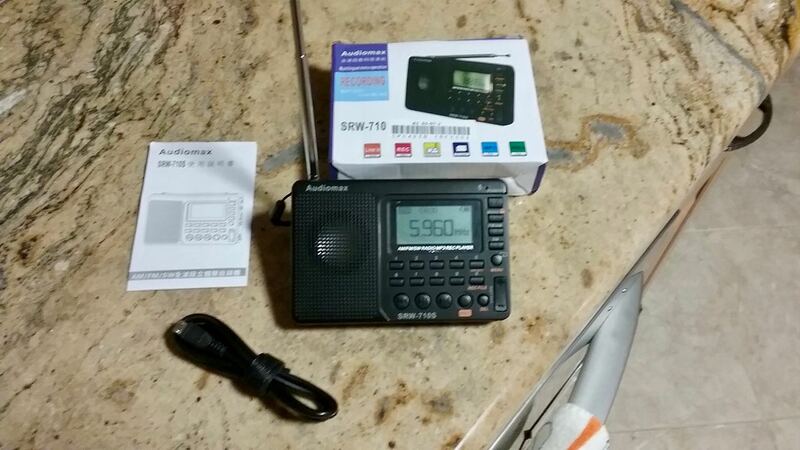 Why would someone want a sub-$20 shortwave radio? Wait … I guess I should be answering questions & not asking them, right? But I’ll give you my answer to “why I want a sub-$20 shortwave radio”: I have many nice radios, but I wanted one that I consider “disposable”. I define “disposable” as something I won’t be upset if I lose, get it splattered with paint, or leave it outside only to get rained on. Taking the family of four to the movies nowadays costs upwards of $100 (the three ladies I live with can really throw-down pop & popcorn!) so a sub-$20 radio, even a “disposable one”, is a true bargain. I have seen the SRW-710S badged under three different names: Audiomax, VITE and TIVDIO. There very well may be other badging. I paid $18.52 for my Audiomax badged device direct from a vendor in China. I’ve subsequently seen it as low as $13 on eBay and as much as $37 on Amazon. So much for a sub-$20 radio, huh? The SRW-710S comes with only a USB charging cable in the box to recharge the Li-ion BL-5C battery (no earbuds, no case or pouch – just a very simple set of basic instructions). The 710S features a small LCD screen that offers menus in three languages: English, Spanish & Chinese. The screen greets you with “welcome” (lowercase) when turning it on & “Bye Bye!” when you power-off. There is a Sleep Timer function that I have yet to use. All of the ports are on the right side of the unit (nothing on the left). It has a TF Flashcard Slot – no card provided – for recording off the radio & for playing pre-loaded mp3 & wma files from the flashcard. It has 100 memories, a Line-In port, a built-in mic, and a headphone port. There is no ANT-In port. This radio has AM, FM & SW (no LW) with the appropriate international tuning steps. Lastly, there is no folding stand on the back (one is provided and is attached to the wrist strap – it is inserted into a small slot just above the battery cover). One Chinese web site listed the SRW-710S as having an “AKC6951 DSP chip”. Until now, I had never heard of this DSP chip and I frankly know nothing about it. Maybe some more informed readers can comment? Operation is easy (except for one quirk that I will detail later). There are two rows of numbers for direct input of a frequency. Simply input the frequency … and then wait (there is an approximate 3-5 second delay from input to the radio actually tuning to the frequency … I am still getting used to this pregnant pause). You also have an option of tuning directly to a meter-band. Of course, there is no SSB for this low price. The one speaker is a bit “tinny” but adequate (stereo via user-supplied earbuds). And considering the price point, the RF shielding isn’t too bad. I can actually use the shortwave band of this radio in my kitchen and breakfast nook (I cannot say that for my more expensive receivers). The biggest limiting factor in reception is the size of the telescopic antenna (15.5”). However, for its size I am quite impressed (it’s exponentially better than the old Grundig G2000A Porsche that has a 21.25” antenna – but that radio is notorious as needing a reel antenna). Just via the telescopic whip, I can actually tune the major broadcasters to NA (e.g., Radio Romania), I can adequately tune to the VOA 15.580 MHz signal to Africa during the North American East Coast AFTN, and the time signals are easily audible (of course, frequency appropriate for the time of day). One quirk I have found: there is a “Lock” key. However, it only seems to lock the radio power “on” (locks are used to lock the power “off” during transport so the power remains off and the battery doesn’t drain). The “Lock” feature is not discussed in the instructions and at present I have not figured-out if this switch works in the traditional way. I find this to be quite amusing because it’s either an odd quirk or I’m just not smart enough to intuitively figure it out. 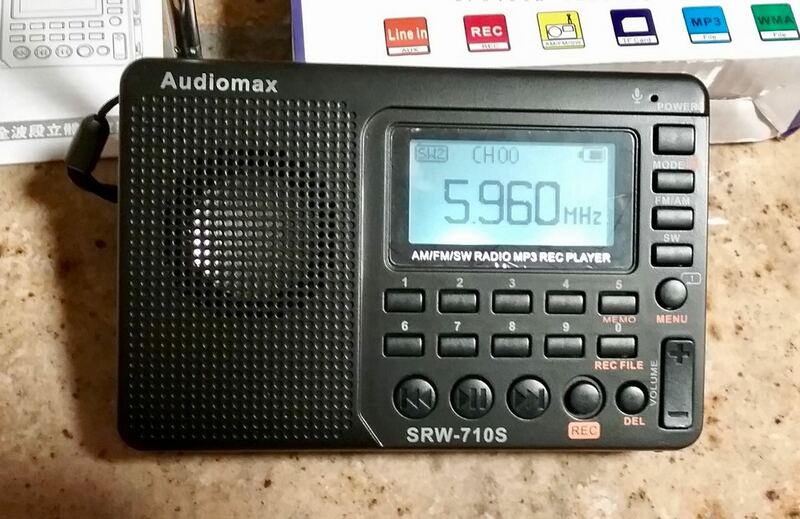 I am quite satisfied with my new “disposable” $18.52 Shortwave Radio (I have no information whether the quality I have considered is consistent through a production run or between badging). For those who wish to listen to a local AM or FM station – or listen to one of the “major” shortwave broadcasters with a booming signal into your part of the world – you can’t beat it for this price point. I can see myself using this radio while I complete outdoor household repairs or while cleaning-up the garage. Too bad it’s so close to Christmas, this would make a great stocking stuffer to introduce someone, young or old, to the world of shortwave. Note that the lowest prices omit the model number in eBay search results. Click this link to search eBay for the SRW-710S on eBay. Scroll through search results to find a matching receiver. Thank you, Troy, for mini-review of the SRW-710S! Like you, I have very low expectations from shortwave portables at this price point. Still…for the glove compartment of your vehicle, for outdoor listening, for small gifts? These fit the bill! I’m most impressed you could receive the number of stations you did from inside your home. This entry was posted in New Products, News, Portable Radio, Radios, Reviews, Shortwave Radio, Shortwave Radio Reviews and tagged Audiomax SRW-710S, Audiomax SRW-710S Review, Shortwave Radio Review, Tivdio V-115, Tivdio V-115 Review, Troy Riedel on December 15, 2016 by Thomas.